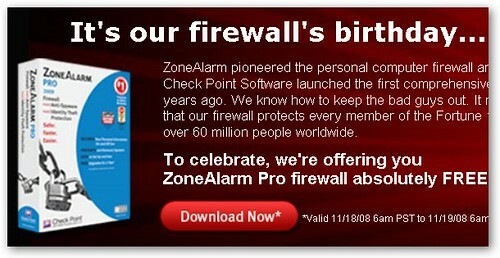 ZoneAlarm is giving away the pro version of their firewall software today which normally retails for $19.95. The offer ends 6 a.m. PT on November 19 so act quickly. You're asked for your name and email address so they can send you the download link for the software and a unique license. Although Windows XP and Vista come with a built-in firewall, ZoneAlarm gives you more control over firewall behavior, especially over outbound connections.